In our completely biased opinion summer is the best time of year. The long days are spent soaking up some quality sunshine and nights are spent camping out in the woods. 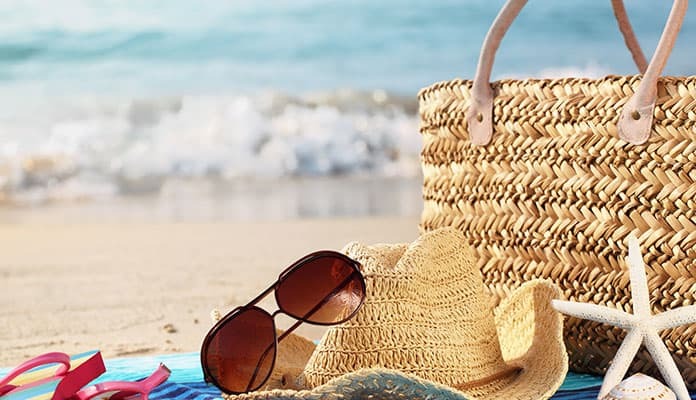 Whether you are heading out for a picnic or to spend a lazy day on the beach, you will likely be bringing along a lot of beach gear with you. That is why it is important to have the best beach bag to secure all your belongings along with you. Finding the best beach tote isn’t always the easiest task. With the movement to go towards reusable bags on an upward trend, we are left with a market that is very saturated. With so many options out there, it can be hard to find a beach bag that will work best for you. To help, we have created a list featuring what we believe to be the best of the best. Focusing on durability, style and function, these beach totes are sure to make your summertime much more enjoyable. If you are in the market for a colorful bag with loads of pockets for your belongings you should consider this bag. It comes in 10 funky color combinations that ensure you can recognize your bag. It has 8 large pockets so you can sort your stuff perfectly. There is even a secret inside zippered pocket that you can put your wallet and car keys. This bag is made from a waterproof mesh material that has a quick drying feature built in. The mesh also allows the sand to fall through the bottom and not accumulate. Extra long handles give you the ability to carry it from your shoulder even when it’s full of your gear. Dejaroo also cares about their customers and prove it through their policies. For example, they offer a 100% satisfaction money back guarantee. They know you will love this bag and expect it to be durable to stand up to your use. 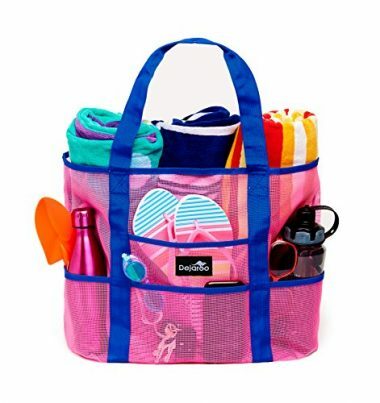 Odyseaco has made of the top rated beach bags on the market. Their Aruba Mesh Beach Tote Bag has many options that make it stand out from other beach bags. For example, it is ultra lightweight coming in at under 2 lbs. This gives you the option to fill it up with everything you could possibly need for the perfect beach day – and we mean everything. 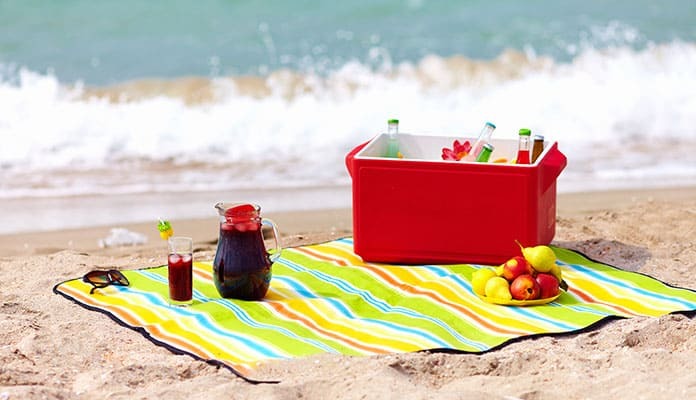 You can easily fit 4 large beach towels and still have enough pockets for cold drinks, beach toys, and even a wireless speaker. It also has a zipper at the top which secures your belongings in wind or a trunk of a car. You will be impressed to know that it even has a cooler bag feature built in as well that keeps your drinks frosty cold. This travel beach bag even comes with a bonus waterproof cell phone case so you don’t have to worry about getting sand or water in your phone. The straps of this option drop 9” which is why it’s so easy to carry. You’ll find yourself reaching for this bag every day, not just ones spent in the sun. If you’re looking for a beach bag that can double as a large purse this Beach Bag by Mokus Gear is perfect for you. It features a nautical style rope handles and a simplistic minimal design. The material used on the outside is durable enough to stand up to the abuse of everyday life. You will no longer need a backup bag. It comes in 4 colors ranging from a striped red and blue and a patterned dark and light blue. The outside material is a cotton and polyester material which has been designed with durability in mind. 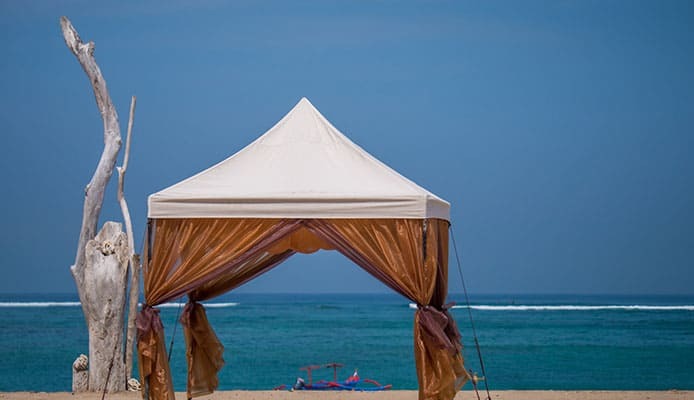 It also comes with a liner that is waterproof so you have a barrier between your belongings and the sand and water. It has a zipper at the top that helps to isolates your belongings from sand. You don’t have to be in Oahu to appreciate this lightweight beach bag. It is made from a combination of mesh and waterproof material that creates the perfect beach bag. The mesh is an excellent material that is not only lightweight but also disperses heat to keep your stuff cool. It also has a specially designed waterproof base that allows you to not have to worry about placing this bag on a dry surface. The Oahu XXL Mesh Beach Bag also folds into itself making it great for traveling. Simply toss it into your luggage to use as a small beach bag, or even use it as a carry on. Small things like an attached carabiner make this an excellent option. When all of this is coupled with a 12 month worry free warranty this bag becomes a no-brainer. Odyseaco is a company that you can trust. They have your best interest in mind and will do everything to make sure you are a happy customer. 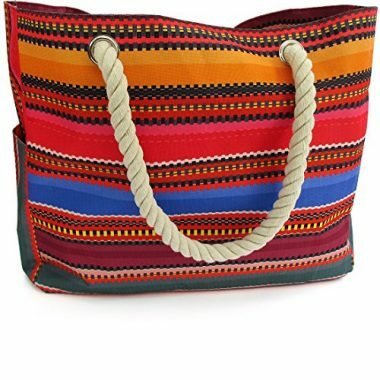 This brightly colored beach bag will fit your boho style perfectly. Even though it is surprisingly lightweight it has been constructed from a tough ripstop fabric. This makes it water, tear, and sand resistant meaning it will last for years to come. The stitching has also been reinforced so it won’t pull at the seams when it’s fully loaded. It also has a waterproof liner so you can rest assured that all of your important things like cell phones and wallets are kept dry. The entire bag is machine washable so if you find it’s getting a bit dirty simply throw it in the wash and forget about it. The Baja Waterproof Beach Bag also has loads of pockets to keep your stuff organized and safe. Two external pockets are perfect for water bottles or things you need to grab quickly. They are also lined so they will keep your drinks colder (or hot) for longer. This is one of the cute beach bags on our list. 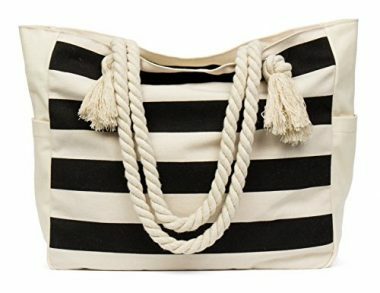 It comes in a bright pink and white stripe design with rope shoulder straps that have a 14 inch drop meaning you can overload this bag without it becoming difficult to carry. Even this has a large carrying capacity it doesn’t weigh too much. The outer material is a high quality canvas that has been engineered to be durable and strong. There are loads of pockets for everything you need including water bottles, sunglasses and even a spot for your laptop or tablet. Don’t worry when your bag tips as the zipper keeps your stuff safe. Beach tote bags reviews are raving about ShyLero’s latest bag. This large beach bag is sure to fit all your summer gear with ease. This bag is incredibly durable with high quality stitching that keeps this bag strong for longer. This impressive waterproof bag is ideal for the beach or boat trips. With a water repellant interior you need not worry about your scuba gear or towels soaking into your bag. As a bonus, this tote bag comes with an added waterproof case. The ultimate beach accessory, this case will easily fit your smartphone, keys and some money. Great for snorkeling and beaching this accessory will quickly become your new summertime favorite. Fully dust, water and sand proof, this durable case will be able to withstand anything you can throw at it. With outstanding reviews, ShyLero is incredibly confident that you will love this beach tote. So much so that they are even including a full 100% money back guarantee. This means a risk free purchase for you sweetened with the promise of lifetime customer support. This company truly thought of everything. With a side hook to hang your keys you can easily attach your keys for added convenience. This key holder doubles as a bottle opener which allows you to make the most of your summertime. Made with quality in mind this bag is fully washable meaning that it will last you even longer. Two external side pockets allow you to carry water bottles and sunglasses separately for easier access. The quality rope handles fit over your shoulder and have a soft and comfortable feel. 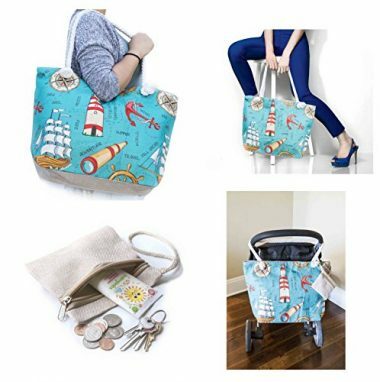 Big enough for the whole family this beach tote features a magnetic clip to help secure all your belongings with confidence. 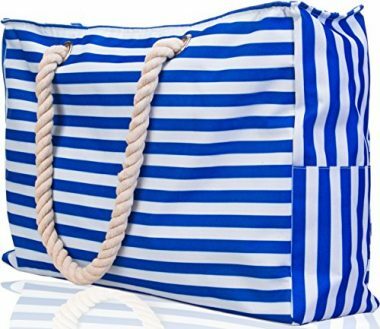 This JJMG beach bag has a nautical theme. It comes in 6 styles that feature anchors, ships and lighthouses. You will be sure to stand out from your friends. What makes this bag excellent is that it has been specially designed to be used with a stroller. The straps are long enough to easily loop over the handle which give you even more storage space for long beach days with the family. You will love the zippered top that allows you to throw everything into this bag without worrying about it tipping over. This bag is large enough to carry everything from beach towels to diapers and even hats and sunglasses. This packable beach bag is great for your next holiday. The ultimate carry on, this bag will allow you to bring all your gear with you while still fitting within the airport size constraints. Coming in a pale pink or a stunning navy blue this Pier 17 tote stylish tote is perfect for all things summer. With the words summer time written on the side this bag is the perfect beach accessory. Featuring a stylish pom tassel on the outside this bag combines style with functionality perfectly. A strong zipper holds all your belongings securely in this large tote. Sporting two internal pockets, one that zips close and the other that has an elastic support, you can organize your bag separating electronics and valuables for easy reach. The picture of durability this beach bag has a 30 pound weight capacity with dual secured inner rivets holding the handles secure. 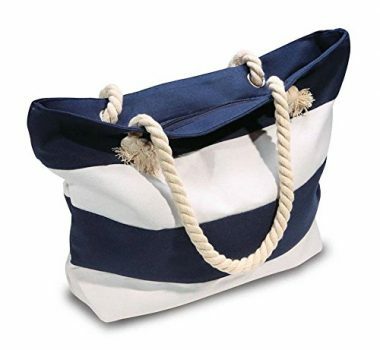 The white rope handle gives this bag a sailor style look that is sure to be appealing. This straw beach bag is incredibly lightweight adding no bulk to your arm. Holding everything you need for the beach this is a summer go-to. Pier 17 has had so many quality reviews about this product that they are quite confident your will love this purchase. So confident in fact that they include a 100% risk free guarantee to your purchase. If you don’t love it simply return it for a no questions asked refund. 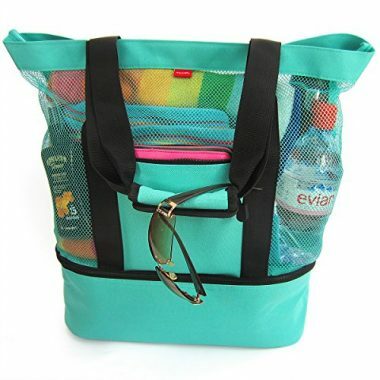 The large size of this reusable tote is perfect for the beach. Incredibly lightweight you will love that this low profile beach tote weighs a mere 2.2 pounds. This canvas style bag is the perfect size for the beach. 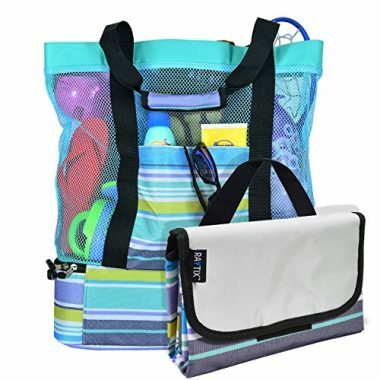 Easily fit 2 large towels, sunscreen and all your electronics into this bag for a great day at the beach. With a large main compartment featuring a zippered closure this bag will safely contain all your belongings. The interior of this bag has 2 pockets that can hold your personal gear and electronics. This means you will no longer have to dig through your bag to find your valuables. It also features an interior zipper pouch that allows you to house your most important things. Coming in 7 different styles this tote offers something for everyone. With a style that can be dressed up or down this tote can transition from beach to restaurant with ease. The comfortable wide strap over the shoulder design is easy to carry even on longer distances. This tote bag is hand washable which allows you to show it some wear without fear. 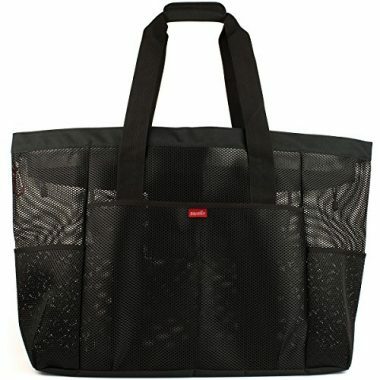 Perfect for camping or picnics this tote is durable and spacious. The high quality 100% cotton material has a soft feel making carrying even more comfortable. Your beach gear is important and that is why it is so crucial to keeping it safe. For that reason, it is important to have the best bag so that you can safely transport all your belongings. Below are the top features to look for when deciding on the best beach tote for you. The best beach bags are made from many different types of materials. The most common material type is cotton. This is because it can be washed if needed and has a desirable soft feel. It can also be combined with a mesh material to help reduce the inside heat. Mesh will allow sand and water to pass through without gathering at the bottom. If you live a messy lifestyle, buying a beach bag that has the ability to be machine washable will allow your bag to have a longer lifespan. Many bags also feature water resistant material that separates them from the rest. These bags transition from mere grocery bags to a quality beach bag. Some bags even have a specially designed waterproof base. This gives you the freedom to simply throw your bag down and start your beach day without looking for a dry place. These bases are generally made from a rubber material that not only waterproofs but also adds durability against dings and dents. Be sure to look at the seams of your bag as well. This will differentiate a bag that is built to withstand more weight. While summer gear is often not very heavy, it is important to consider that once your beach gear is wet, it will likely be a lot heavier. This added weight requires a reinforced stitching to hold up confidently. Arguably the most important part of your beach bag, the straps of your bag should not be overlooked. These should be long enough to easily be swung over your shoulder. Having a wider strap is also desirable as it will sit more comfortably against your skin. Be sure to check the material used in the straps. Be sure to look for straps that are reinforced. If the strap of your bag breaks then your bag loses its functionality. That is why it is important to pay close attention to how the straps of your bag are secured to your bag. Some bags use a wide rope style for their handles. This adds a stylish flair that we appreciate. It is also a strong material that won’t easily break or tear. The only drawback is there isn’t a lot of padding to make this comfortable. When finding your ideal summer bag, be sure to check how many additional compartments the bag has. Any woman knows the importance of organizing their bag. Having separate pockets for your electronics will help keep them safe from any damage or spills. These pockets will also make your valuables more accessible to you by keeping them organized. Some bags even have secret interior pockets. These are great if you plan on spending most of the day in the water while your stuff sits on the beach. Being able to hide your wallet and cell phone will put your mind at ease even if someone stays by it to watch it. If you are a person who likes to keep your drinks cold for as long as possible look for a bag that has insulated pockets. Yes, that’s right, some bags come with insulated exterior pockets to keep your drinks cold. Others come with a special pocket on the inside that has a specially designed waterproof liner that works hard to keep your drinks cold. Some even allow you to add ice. Having a beach bag with a top zipper is incredibly useful, especially when heading to the beach. This not only works to keep your beach gear safe but it will also prevent sand from filling up your bag. Being able to close your bag will ensure that all of your belongings will stay securely in your bag. Some companies have even designed zippers that are waterproof. You will want a beach bag that is able to fit all of your beach gear. Be sure to check the weight capacity of the bag that you choose. It is also important to see what other users are saying. Is it possible to fit enough towels in your bag? These are the questions you want to be asking before determining their usefulness. Most bags are around the same size, but sometimes you come across an oversized bag. The ideal size will depend on what you are planning to use it for and your body size. 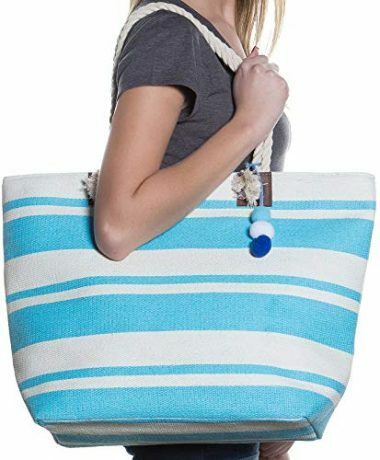 If you are a tall person you can get an xxl bag with extra long handles which will give you the ability to stuff it full of beach towels, sunglasses and even a computer or tablet. Most bags have seams that are prone to pulling apart. If you are planning on carrying loads of heavy beach gear you should look for a beach bag that has reinforced stitching. This will allow you to carry more stuff and make your beach bag stand up to the salt water and sand. In a market as saturated as this one, companies are looking to stand out amongst competitors. That is why many companies are thinking outside the box to create a more desirable package. This is done by adding out of the box accessories. Most often this is seen through things like key holders. Some companies take this a step further by even attaching bottle openers to this for added convenience. It is growing more common for companies to include waterproof cases to make their bag the ultimate beach accessory. These are small separate cases that are fully water, sand and dust proof. A great companion for snorkeling and paddle boarding these cases allow you to bring your smartphone, money and keys in the water with you. This is an incredibly desirable added feature that you should look for. Q: What Is A Beach Bag? A: Beach bags are designed to keep all of your belongings safe when you are traveling to the beach, when you get there, and when you are returning home. The difference between a regular bag and a beach bag is that beach bags are made of more durable materials. They are going to be exposed to the sun, sea, and sand for prolonged periods of time so they need to be able to withstand the rigor. Q: Why Do I Need A Special Beach Bag? A: The truth is that you do not need a special bag, but you can benefit from using a beach bag on your next trip to the ocean. They are made from more durable materials, so they last a lot longer than a regular bag. They are also designed to withstand the UV rays of the sun more. UV rays can damage most materials, so using a beach bag will ensure that your bag lasts well. 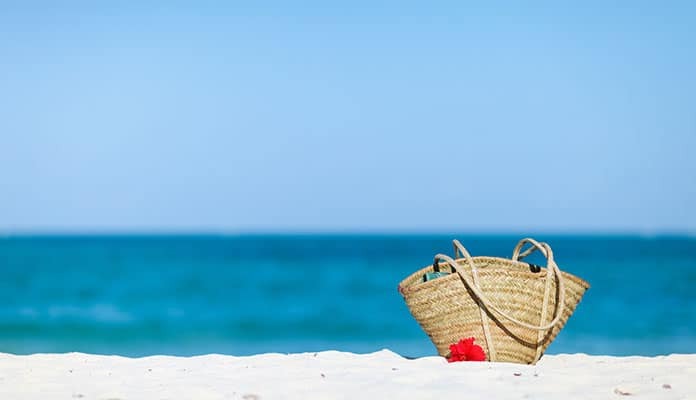 The fact that a beach bag can repel UV rays also means that it does not heat up as much as a regular bag. 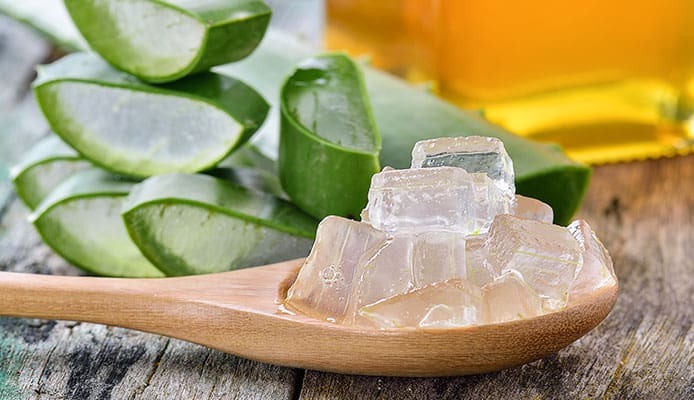 The other benefit of having the best beach bag is that they often come with many pockets to organize your belongings, such as your suncream, aloe vera gels, and sunglasses. Many bags will also have a waterproof base to protect your belongings if the water should come up to where the bag is. Q: How Do I Clean My Bag After A Day At the Beach? A: It is important to clean your bag when it has come into contact with sand and saltwater. There are also particles in the air which can attach to your bag. If the sand and salt are left on the bag, then they can begin to break down the materials in the bag. After regular use, you can empty the bag and shake out any sand. If the bag has been in contact with the salt water, then you should take the time to wash your bag. Take your bag and shake off any of the sand and other debris. The bag can be submerged in warm water, or you can rinse the bag in fresh warm water. This will remove the sand and salt from the bag. If the bag is particularly dirty, then you can use a sponge and soapy water to remove the dirt. Rinse the bag after cleaning. Leave the bag in a cool, dry place until the bag is completely dry and then use it again. Q: Can Saltwater Damage My Bag? A: Salt water can cause mold to grow in most materials. If you allow salt water to sit in material, then, over time, bacteria can grow. This will cause your bag to smell and can begin to break down the material. Q: Can Chlorine Damage My Bag? A: Chlorine can cause fabric to split and shred. It can also cause the color in material to fade. Chlorine will also cause elastic fabric to lose its elasticity. The summer months often get really busy. With so many outdoor activities to take part in you will often find your spare time filling up with picnics, beach days and boat trips. No matter what you choose to fill your days with, it is important to come prepared. Bringing along sunscreen, a bathing suit, towels, blankets and snacks is important. Having the best beach bag will allow you to bring all your gear along with you ensuring you will have the best experience. 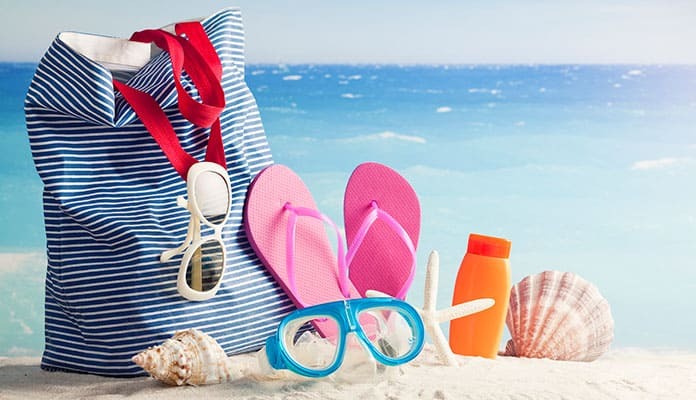 We know both your time and money is important, that is why we have searched the web for the best beach bags for your summer holidays. These bags are all made using only the highest quality material, are lightweight in design and have a large enough capacity to hold all of your important gear. We are confident that any of the beach totes on our list will work for all your summer needs. Do you use one of the bags that made our list for your summertime adventures? Talk to us about how you like it in the comment section below.